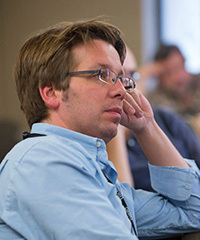 Bjoern Penning has joined the Physics department as a new Assistant Professor. He researches dark matter (DM) and has performed direct DM searches at the LUX-Zeplin (LZ) experiment and collider DM searches with CMS and ATLAS. At Brandeis, he is a member of the High-Energy Physics Group. He will focus on direct dark matter searches with LZ and phenomenological dark matter research. Penning received his Ph.D. from the University of Freiburg. Previous to his arrival at Brandeis, Penning was a Lecturer in Experimental Particle Physics at the University of Bristol. Penning will teach Particle Physics (PHYS 107b) during the Fall 2017 semester. Today at CERN joint seminars were given by the two major experiments (ATLAS and CMS) at the Large Hadron Collider (LHC) in which they announced the observation of a new particle that could be the Higgs Boson. The mass of this particle is 126 GeV, roughly that of a Barium atom. The level of statistical significance of the new particle is five standard deviations, which is general considered the threshold level of observation needed to make a claim of discovery. Higgs Boson has been long sought to complete the Standard Model of Particle Physics. The Brandeis High Energy Physics Group, along with many colleagues from around the world, has been working for the last 18 years designing, building, commissioning, running and analyzing data from the ATLAS experiment (at CERN). The Standard Model of Particle Physics is our best understanding of the laws of nature that govern the behavior of all the things in the universe that we can see. One outstanding question in this theory has been: “where does mass come from?”. One proposed solution to this problem (by Peter Higgs) was the addition a field to our picture of the universe that adds a drag on each particle, different for each kind of particle, which we interpret as inertia or mass. This theory predicts a new particle, the Higgs Boson. Finding this particle is considered proof of this version of the standard model. One comment on “physics speak”, a particle being “consistent with the Higgs Boson” is not the same as “discovery of the Higgs Boson”. The predicted properties of this particle are very specific and much more work needs to be done to establish the exact nature of this new object. Is it the object that completes that Standard Model or is it a slightly different object that will point to a new direction in the understanding of nature? This question will be hotly pursued in the future running of the experiments. On a local note, in a more technical vein; one of the two decay modes that were used by the ATLAS experiment to look for the Higgs Boson decays into four leptons, either four muons or four electrons or two of each. The electron and muon being two of the three leptons (meaning these particles don’t participate in the strong or nuclear force) of the Standard Model. The Brandeis HEP group has been instrumental in the design, construction and operation of the system that identifies and measures muons produced in the collisions at the LHC. For more information about the projects and the judging process, read the story at Brandeis NOW. The Higgs Boson is an elementary particle predicted by the Standard Model of particle physics. It is associated with the Higgs mechanism that was developed with the contributions of physicists Brout, Englert, Guralnik, Hagen, Kibble and Higgs in 1964. This mechanism proposed an elegant solution to one of the standing problems in particle physics – how particles acquire mass. The elementary particles of nature have masses varying by many orders of magnitude. For instance, the top quark, the heaviest known particle yet, has a mass that is roughly 340000 times that of the electron. Neutrinos on the other hand, have masses that are constrained by experiment to only a small fraction of the electron mass. The Higgs mechanism suggests that all particles acquire their mass by the strength of their couplings to a field that permeates the whole universe – the Higgs field. The top quark does not get its higher mass because it is bigger in size; in fact it is probably no larger than an electron. It simply couples more strongly to the Higgs field to get its enormous mass at around 173 GeV. Photons do not couple to this field at all and hence are massless. The much sought after Higgs boson is the quanta of this hypothetical field, very similar to the photon being the quanta of the electromagnetic field. One of the main goals of the LHC physics program is to find evidence of this quanta, the Higgs boson. Higgs bosons, if they exist, can be created in proton – proton collisions at the LHC but would decay instantaneously. Any search for them has to be carried out by analyzing data for signatures of Higgs decay. This is not a trivial task however, because such decays are impossible to distinguish from some other well known Standard Model processes. Collision data from LHC would have to be analyzed, and deviations from known background processes would point towards some form of new physics and possibly the existence of the Higgs boson. One would then have to compare the rates in different Higgs decay channels to see if the observed rates match those from predictions for a Higgs decay. 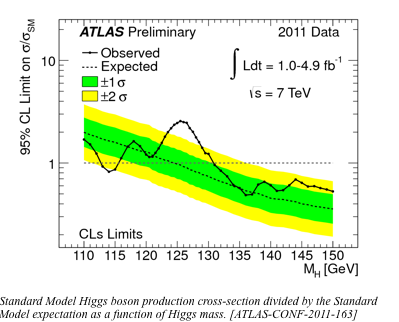 In December 2011, ATLAS and CMS, the two main experiments at LHC, announced their 2011 Higgs search results which led to much hype in the physics world and the media – both experiments were indeed seeing some excess in several Higgs decay channels around 125 GeV. The mass of a proton is about 0.94 GeV, so the finding suggests a Higgs boson mass that is about 133 times heavier than the proton (notice the bump in the above plot from ATLAS at around 125 GeV). However, it is still very early to come to a conclusive statement about a discovery. Standard Model backgrounds are subject to statistical fluctuations which show themselves at various levels in experiments. A discovery would only be claimed if the deviations from expected backgrounds are over 5 standard deviations. The results announced by CMS and ATLAS in December 2011 were 1.9 and 2.6 standard deviations above expected backgrounds respectively. Though this is interesting, it is far from sufficient to provide a conclusive answer about the existence of the Higgs boson. The search will have to continue in 2012 as more data from LHC becomes available, and physicists will finally be able to give a conclusive answer to either confirm or exclude the Standard Model Higgs boson, ending a puzzle that has been around for several decades. Serdar Gozpinar is a 5th year graduate student in the high-energy physics group at Brandeis working on the ATLAS experiment at CERN. The Higgs boson has been sought for many years by high energy physics experiments. It is the only particle in the standard model of particle physics that has not yet been observed and plays a crucial role since it gives mass to the other fundamental particles. Tomorrow at 8:00 am EST (Tues., Dec. 13), CERN is giving a seminar (webcast) about the status of the search for the Higgs at the LHC by the two general purpose detector collaborations, ATLAS and CMS. Although the data is not quite strong enough yet to claim a discovery, the evidence is becoming strong. The Physics Department will show a web cast of this seminar in Abelson 131. The Brandeis high energy group has been a member of the ATLAS experiment for many years and has been instrumental in building parts of the detector that are key to this measurement. I will be there to answer any questions. Although it is early in the morning for most, if you are interested, please come to what should be a very interesting talk. The ATLAS Experiment, in which the Brandeis High Energy Physics Group participates, has announced evidence for a quark-gluon plasma. This is a state of matter that existed for the first few microseconds after the birth of the Universe when quarks and gluons roamed freely before the Universe cooled enough for them to combine into the protons and neutrons that make up the matter we know today. A phenomenon known as jet quenching, which is considered evidence for the production of a quark-gluon plasma, has been observed and accepted for publication in Physical Review Letters. ATLAS is one of the experiments at the Large Hadron Collider (LHC). We have just completed a successful first year of running. At the end of the run we studied Heavy Ion collisions (lead on lead). Head-on collisions by two lead nuclei are expected to produce a quark-gluon plasma. In this process, the products of hard collision (jets) are reabsorbed by the plasma. Observation of this process by ATLAS is considered evidence for the production of a quark-gluon plasma. Being able to produce and study this phenomenon will help us understand behavior of matter at the very beginning of the Universe. More information about this phenomenon and details about the ATLAS experiment can be found at the http://atlas.ch/ web site. The Brandeis High Energy Physics Group includes professors Jim Bensinger, Craig Blocker, Larry Kirsch, Gabriella Sciolla, Hermann Wellenstein and research scientist Christoph Amelung.